Poor St. Bartholomew....skinned alive (he's the patron saint of tanners--no joke). Hl. 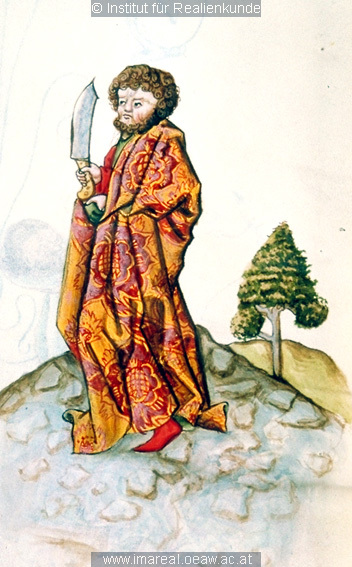 Bartolomäus is almost invariably depicted (ca. 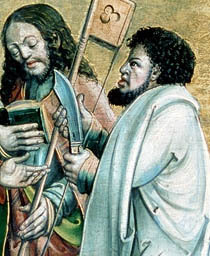 1400-1550) holding a contemporary version of the instrument of his execution--a large, clip-point knife with scale grip. 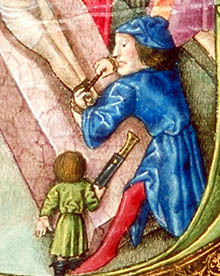 See the image below of St. B. testing the edge with his thumb--at least he had a sense of humor about it. I know generally how tubular rivets are made/set, but I have no hands-on experience. For this project, should I drill the main hole, then countersink a slightly larger hole for the peened edges of the tube to rest in? Tool tips? Steel or brass tubing for the rivets? I assume the brass would be much easier/neater to work with since it's so easily annealed. But is one material more historically appropriate than the other? If the tubular rivets don't work out for some reason, is it historically appropriate to use solid rivets? One of the images below offers a clue about the carriage and purpose of such knives. See that little Torturer's Apprentice? He's handing Daddy one of these knives in its sheath with a byknife or pricker. That treatment suggests to me that this is just a general purpose knife--a Bauernwehr or Hauswehr. Is that right? Am I justified, historically, in calling my project a Bauernwehr? Or is this something else--a form of butcher's knife that the medieval Average Joe would immediately recognize as distinct from his everyday knife? Should the scabbard/sheath be of thick leather or more like a sword scabbard--thin leather over wood core. The aforementioned image of the byknife suggests the latter, doesn't it? Maybe both methods are appropriate. Most of these knives clearly have bolsters, but in some cases the wood scales just seem to bevel down to the blade. I don't mind making a sandwich-type bolster, but if that isn't an historically accurate method I'd rather stick to the all-wood grip if that would be more accurate. For an overview of construction I can't recommend Knives and Scabbards enough. It was originally published by the Museum of London, and was republished by Boydell press. Amazon have it, as do Oxbow Books (my preferred supplier because they do a lot to make sure that books of interest to medievalists are kept in print). Most of your questions should be answered in there. Rivet-wise either solid or tubular are found. This may be dependent on time, place and style of knife though. Scabbard-wise you're probably looking at two layers of thin-ish 1.5mm or so leather. The inner one grain side in and the outer one grain side out. That's extremely helpful, Al! Many thanks! Al has the right of it but I would add solid wire used as a rivet like the knives from Historic Enterprises have seem far more common in museums and I don't think Knives and Scabbards has one hollow tube rivet in it. Also note that Knives and Scabbards mostly only covers small knives and not the lager carving or skinning knives like you are looking for Sean but the technology is the same. Hmmm...those are just pins, right? My tang is already pierced for pins. Would those be peened or just inserted and cut off flush with the scale? Correct they are normally set flush with the handle. I guess my rivet/pin choice will be determined by how recklessly overconfident I'm feeling. I'll have finished my sallet and bevor project, which I've handled with great caution, so I might just go wild on the knife project. There are tube rivets in a 15C knife in my collection. The table on page 26 of Knives and Scabbards shows 5 knives with tube rivets. Both I would have thought. Peened into a gentle countersink and then ground flush with the handle. I don't know if they did it in period, but it would seem resonable to glue the scales on with some hide glue too. I would agree that there are quite a few knives in knives and scabbards that have hollow rivets, but more with solid. In both cases a large number were in brass/bronze/latten as it is easy to work especially for hollow ones. If using tubular, a small countersink helps, and I make a small punch a little like those for setting eyes in fabric or leather. Abit of practice will havinbg you doing them neatly and quickly. This is great information! Thanks, everybody! How do you guys make the tubular rivets? Do you start with a brass tube from a hobby supplier? I'm neither Tod or Mark, but I'll answer anyway . I usually use brass tubing as it is easy to get hold of, and it saves some work. I have also made some tubular rivets from brass sheet, thickness ranging from 0,5 to 1 mm. The 0,5 mm stuff works well, the 1 mm can be a bit tricky to get to shape. When using sheet i use flat and needle-nose pliers to curve it around a rod of appropriate thickness. One should maybe braze or solder the joint, but I can't do that in my apartement... You can hide the joint through some careful peening anyway. 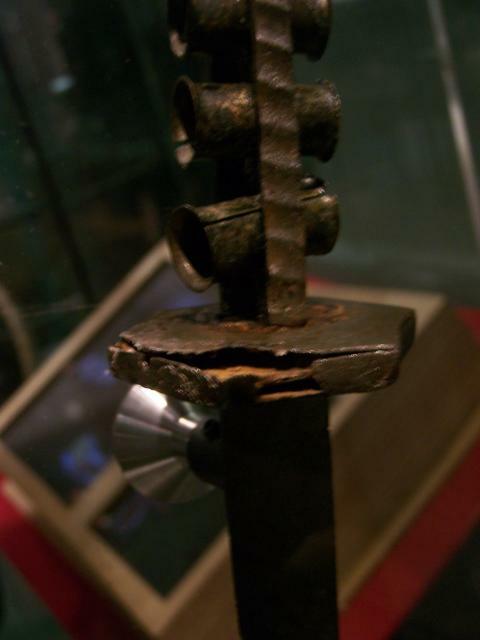 And Matt Easton made this photo of a dagger in the Museum of London. Note the open seam of the rivets and the flared lips, which are not really peened flat. Rather, they appear to have simply been flared out by the same method described in the link above. So maybe the holes in the scales should have slight, conical countersinks rather than flat countersinks. You know I looked at that knife and even have 3 images of it on my site and I didn't realize until now that those were large hollow rivets. I think the epiphany for me as far as the hollow rivets are concerned is that what looks like thick-walled tubing may actually be thin-walled tubing with a lip/peen. That makes things much easier, and should give a neater finished appearance. Tubular rivets were fitted a bit like scroll pins and then flared out; again I don't bother with a countersink unless into bone. To my knowledge they were not soldered and usually overlapped like a scroll pin; the ones on the dagger are unusually neat. You can slit a length of KandS brass or copper tube and use that which will come out correct, you can use it unslit which will come out close to correct and is easy or you can open the jaws of your vice a touch, place a long piece of flat strip on the gap and tap into it with a cold chisel to create a 'U' holding the long end then rotate the U around and tap the edges down with a pin hammer to make something close to round and this would be spot on. They were rarely better than that; made by craftsmen yes, but mass produced for profit most of the time regardless. I guess once you have cut your pin down you could tap it through a hole in a plate to round it more. Not sure if it helps but I found this photo. It's not exactly medieval (circa 1650 apparently) but it looks like what you are after and was described by the auction house as a german hunting knife. If you want to get a knife very similar to the ones you have shown us as opposed to making one I suggest you look at some of the custom knife-makers on the web who are making Hudson's Bay Knives. These are essentially big heavy bladed butcher knives that were originally sold or traded for skinning buffalo. Look on ebay for Old Hickory Butcher Knives or Antique Butcher Knives. I picked up an Old Hickory butcher knife that has the same blade profile as the skinning knives shown in the period illustrations. I think it cost me about 15 USD after shipping.